During our meeting, we considered how best to respond to the voice of faithful Anglicans in some parts of the Global North who are in need of biblically faithful episcopal leadership. Of immediate concern is the reality that on 8th June 2017, the Scottish Episcopal Church is likely to formalize their rejection of Jesus’ teaching on marriage. If this were to happen, faithful Anglicans in Scotland will need appropriate pastoral care. Within England there are churches that have, for reasons of conscience, been planted outside of the Church of England by the Anglican Mission in England (AMiE). These churches are growing, and are in need of episcopal leadership. Therefore, we have decided to consecrate a missionary bishop who will be tasked with providing episcopal leadership for those who are outside the structures of any Anglican province, especially in Europe. The communique was welcomed by GAFCON UK. Fall-Out at Falls: The conservative evangelical ACNA parish, Falls Church, Truro, in Virginia, has signed an agreement with the Episcopal Diocese of Virginia, drawing criticism from ACNA Archbishop, Foley Beach. The Archbishop of Canterbury, Justin Welby, has praised the Institute, saying that he was “deeply moved” by its establishment. Llandaff Bishop: The ancient See of Llandaff has elected June Osborne to be its new bishop figure. Osborne, who served as Dean of Salisbury Cathedral, is hailed by the Church of Wales as, “A ground-breaking figure in the Church of England,” because she was the first woman to get the coveted job of Dean at a medieval cathedral. Now Osborne is set to break yet more ground by becoming the first ever woman bishop figure of Llandaff. Osborne is due to be enthroned at Llandaff Cathedral on July 22. FIFNA upholds the all-male priesthood. Sinai Jihad Threatens St. Catherine’s: ISIS gunmen opened fire on an Egyptian checkpoint near St. Catherine’s monastery in the Sinai, killing one policeman. After an exchange of gunfire, in which several terrorists were wounded, the gunmen fled the scene. A spokesman for the monks at St. Catherine’s, Fr. Gregorios, told Egyptian media that it was unclear if the monastery was the ultimate target for the attack. St. Catherine’s monastery at the foot of Mount Sinai, is home to some twenty Greek-Orthodox monks and enjoys a status of autocephaly. It is the world’s oldest still active Christian Monastery, and was declared a UNESCO World Heritage site for its Byzantine architecture, and collection of icons and manuscripts. Qaraqosh Liberated: Once home to Iraq’s largest Christian community, the town of Qaraqosh celebrated its first public Easter services following the town’s liberation from the Islamic terror group, ISIS. ISIS seized the town in 2014, destroying Christian churches, homes and businesses, forcing the majority of Qaraqosh’s 50,000 strong population to flee. However, the town was liberated from the terrorists in October as part of a wider offensive to retake Mosul and returning Christians were able to celebrate Easter in those churches still standing. 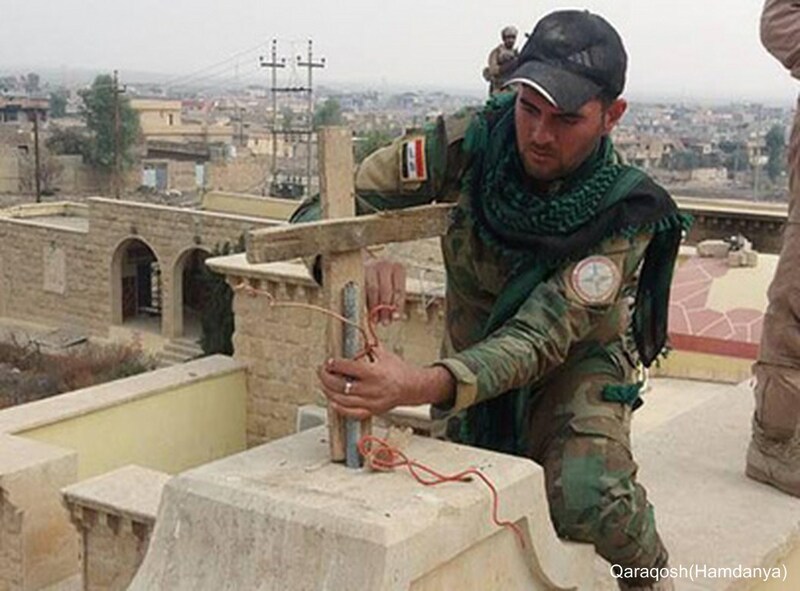 To mark their new freedom from persecution, a large Cross was erected in the town in May in the presence of Christian militia members from the Nineveh Plains Protection Units. The Cross was sponsored by the French charity SOS Chretiens d’Orient. Forward in Christ urges your prayers on behalf of the persecuted Christians of the Middle East. Trump Orders Religious Freedom: Coinciding with the National Day of Prayer, President Donald Trump signed an Executive Order in the White House Rose Garden defending religious freedom. Called “Promoting Free Speech and Religious Liberty,” the order promises “regulatory relief” to organizations, such as the Little Sisters of the Poor, which object to Obamacare’s contraceptive mandate. The order also relaxes IRS enforcement of the Johnson Amendment, that bans tax-exempt organizations from political activity and speech. Some conservative religious groups applauded the order. “The open season on Christians and other people of faith is coming to a close in America and we look forward to assisting the Trump administration in fully restoring America’s First Freedom,” stated Family Research Council President Tony Perkins.